Great, so I’ve logged into the game...now I’ve got a bunch of buttons that I don’t know what to do with! Help! Relax, and let’s break it down! As you can see, I’ve labeled your buttons. Let’s go! 1. This is the footer menu, and will provide useful links that you will eventually need during your game experience. 1G: Copy right: the copy right reflects that the page is copyrighted. 2. This is the link list, and can be edited with a plus account by clicking indicated button (2A). 3. This is the info box, and will display game related information that might be handy. 4. This is the Alliance info box. 4A will take you to the alliance overview; 4B will take you to the alliance’s forums; and 4C will take you to your embassy. 5. This is the hero’s information box. It will provide useful information about his health, and experience points needed to level up again. If you click his (or her) picture (5a), you will be redirected to the attributes page for your hero. If you click 5b, it will take you the adventures page. This will display all of the adventures you have for your hero. And lastly 5c is a direct link for the auctions page. 6. This button will take you back to the village overview--or “resources” as it’s labeled in game. 7. The village center button will take you into the “center” of the village, where you can upgrade your buildings and train more troops. 8. The map button takes you to your map, so you can see your neighbors, plan attacks, and find alliances. 9. In Travian, we measure statistics based on population, attacks, defense, and your ability to grow and rate you against the other players on the server. By clicking this button, you will be taken to the stats page where you can see all of this. 10. You also receive reports based on many events in the game. These are important, as they show troop movements and resource movements. If you click this button, you’ll be taken to the reports page where all of your reports are collected. 11. 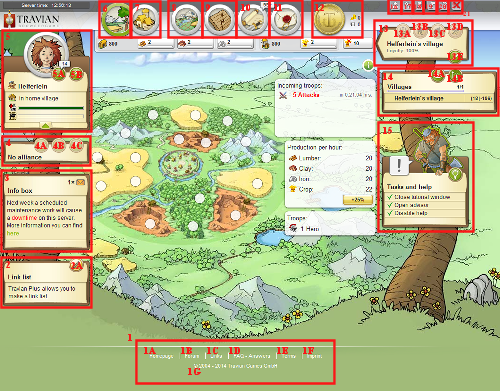 In the game of Travian, there are many other players who are on the server. Any player on a server can be communicated with the use of an in-game message. By clicking this button, you will be taken to your messages center. 12. In the latest version, we’ve updated the plus menu’s design. This button will take you to the plus menu. 13. This box is the info box for the village your currently on. It will provide useful information, such as the loyalty of the village. You also have a couple more buttons to use: 13A will take you to the market place (please note that this button is a Plus account function); 13B will take you to the barracks(please note that this button is a Plus account function); 13C will take you to the stables (please note that this button is a Plus account function); 13D will take you to the siege workshop (please note that this button is a Plus account function); and lastly 13E allows you to edit the village name. It is important to note that in order to use these buttons your plus account must be enabled and you have to have the appropriate building for that button. 14. This is your villages list. It provides you clean list of all of your villages. By clicking on the village names, you will change villages so that you can upgrade in other villages. 14A will bring up the statistics on your village and 14B will display the village’s coordinates. 15. Until you complete the tasks, there is a task master to guide you. This is him. He will provide “quests” for you to complete, and then rewards for completing them. 16. This button is your profile button and will take you directly to your profile. 17. This button is your options and will allow you to edit account settings.